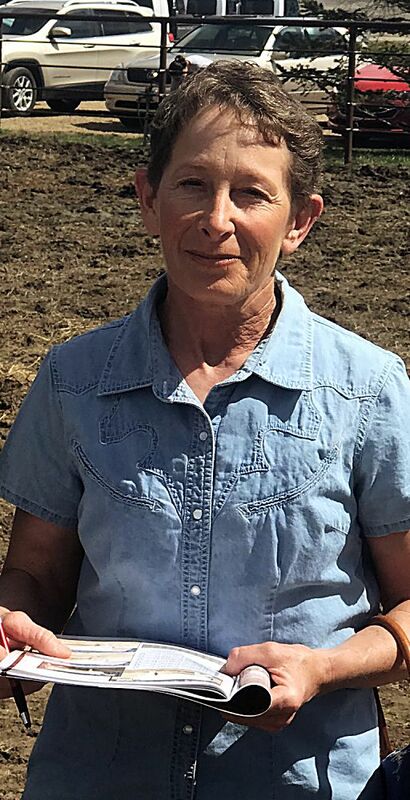 Charlie Rostyne, Carthage, South Dakota, bought four bulls. 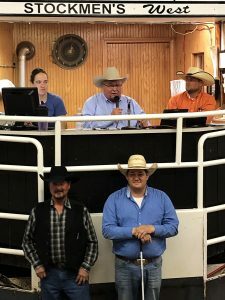 A big crowd gathered at Madison Livestock to bid on top quality Charolais bulls from the herds of Jeff and Linda Stewart from Lake Preston, and Travis and Deb Steffensen from Arlington. 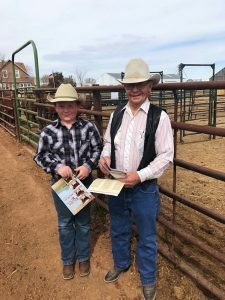 Their sale was held in conjunction with a bred heifer sale at Madison Livestock, making for a great way to showcase these well-grown Charolais bulls. There were many repeat buyers on the seats, coming from the surrounding states and from both eastern and western South Dakota. 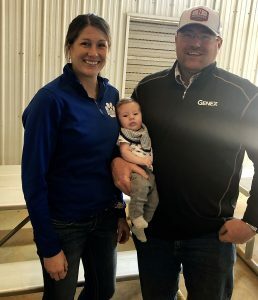 Since profitability is important for all bull buyers, the Stewarts and Steffensens offer genetics with calving ease and high performance. 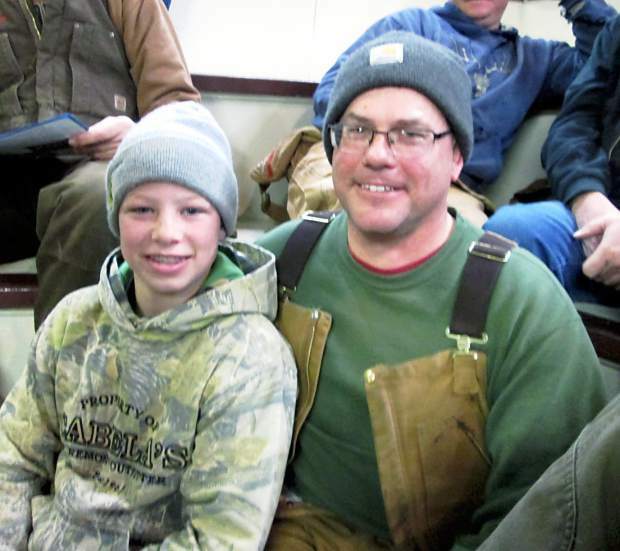 If you didn’t make it to this year’s sale, you should call up Jeff or Travis so that you can visit their farms to view the upcoming prospects for next year. 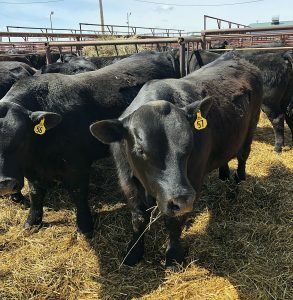 The use of a good Charolais bull on an Angus cow can really add pounds to your calf crop. Top selling bull of the day was Lot 14, selling to Dale Benson of Sioux Falls, South Dakota, at $7,250. This polled Charolais was sired by DCR Mr Big Success A272, and out of a daughter of JS Sir Ease 3103 polled. He grew well from his 90 pound birth weight to his weaning weight of 895 pounds. He was in the top 15 percent in weaning weight and top 8 percent in yearling weight. His EPDs were CE 1.2, BW 1.4, WW 39, YW 75, MILK 2, and MTNL 21. Richard Koistinen of Hayti, South Dakota, selected Lot 2 at $7,000. He was also sired by DCR Mr Big Success. This performance bull was very long sided, having EPDs of BW 3.2, WW 43, YW 78, and MTNL 25. He was out of a daughter of JBJ Platinum 421P. The Lot 1 bull sold to Jeff Ebersdorfer of Fedora, South Dakota at $6,750. This eye appealing herd sire prospect was sired by Double-H Hot Water 028X and out of a daughter of JS Sir Beyond 5218. Born at 91 pounds, he weaned at 896 pounds. His EPDs included BW 2.0, WW 47, YW 77, MILK 13, and MTNL 36. Lot 29 also sold for $6,750, with Dale Benson back to make the purchase. Here was another bull sired by DCR Mr Big Success. Out of a daughter of RC Sirloin 6111 polled, he had EPDs of BW 1.4, WW 39, YW 74, and MTNL 27. Wade Bennett, Central City, Nebraska, kept nodding his head until he paid $6,500 to own Lot 5, a son of WCR Sir Tradition 9407P. This was a fall bull out of a daughter of JS Sir Ease 3103 polled, and he had EPDs of BW 1.8, WW 42, YW 71, and MTNL 26. Another bull at $6,500 was Lot 54. His new owner was Dale Foster from Madison, South Dakota. This April calf was 75 pounds at birth, yet grew to a weaning weight of 884 pounds. His EPDs were BW 2.1, WW 42, YW 83, MILK 9, and MTNL 30. David Minor, Brookings, South Dakota, paid $6,250 for Lot 3, a Big Success x Sir Beyond. This bull had natural thickness and high performance. The top selling Red Angus bull was Lot 58, a son of Crump Roosevelt 301. His dam side showed BJR Make My Day 981, and the bull weighed 71 pounds at birth. His EPDs were BW -1.6, WW 51, YW 75, and MILK 23.